Even if you share my rigorous vigilance for April Fools' Day jokes, didn't you move your face a little bit nearer to your screen, hoping? 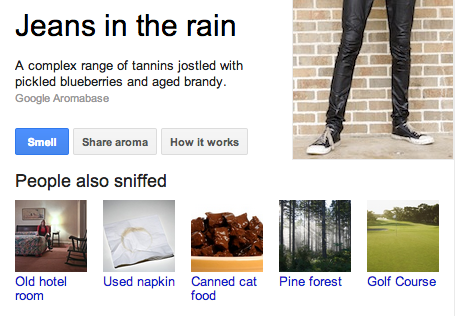 Even in its scentless state, I wish Google Nose would've lasted past yesterday, and expanded its "people also sniffed" options. I "sniffed" wet dog, fear, and campfire, but didn't even see horse manure! No joke, Nosy Girl is three! How should we celebrate? Happy Birthday to Nosy Girl! You titled your post after one of my favorite smells! Yes! Thank you, Elisa! What is it about birthday candles in particular? Their proximity to cake? Maybe their wick to wax ratio makes for a better blast of that blown-out candle smell? Maybe so?? Or just that they tend to be the first blown-out candles one smells, and with such happy associations, so that scent gets locked in your young psyche? THREE!?! My word, time travels. Happy birthday, Nosy!!!! Eek! Love the twitter posts. Celebrate with tres leches cake? Happy 3rd!! Haha, this made me laugh! I love the name of your blog by the way ---so cute! !